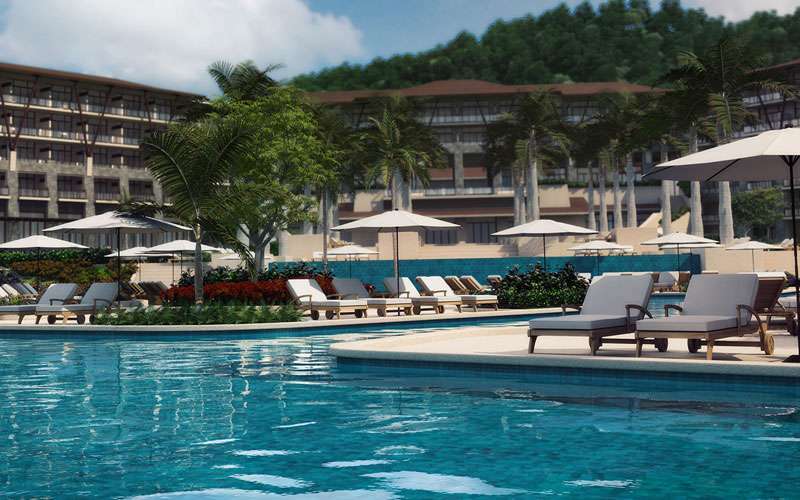 Dreams Las Mareas Resort and Spa is the newest resort built in the pristine beaches of Guanacaste. Specifically, the hotel is in Jobo Beach, a peaceful and isolated white sand beach surrounded by beautiful hills and a lovely mangrove full of wildlife. Located 1 hour and a half approximately from Daniel Oduber International Airport in Liberia, this eco-friendly and luxury hotel is an excellent option for all-inclusive vacation packages in Costa Rica since last November 1st. The resort offers 447 luxurious rooms with a Jacuzzi in each one, gourmet and a-la-carte restaurants, bars and some other amenities such as the largest pool in Guanacaste region, “La Cascada” water slide, kid’s pool and steaming whirlpool; non-motorized water sports; a state-of-the-art fitness center; and a daily activities center. The Dreams Spa by Pevonia offers a sublime atmosphere in its 10 therapy cabins for a variety of treatments, and a hydrotherapy circuit. This all-inclusive resort resort also boasts a beautiful wedding gazebo and numerous reception spaces, making this an idyllic resort for destination weddings. The construction of this beautiful resort was made under a concept that will allow them to qualify for the Leadership in Energy & Environmental Design certification (LEED), as a sustainable building and the total cost of the project was USD $125 million.